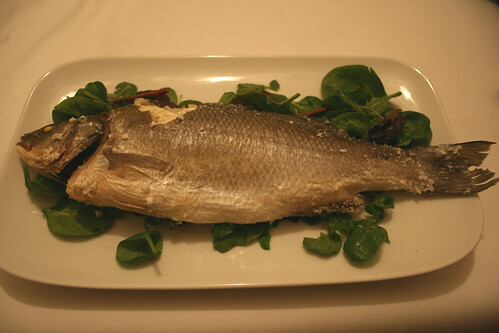 When I first came across sea bass cooked this way I have to say I wasn’t sure about it. I imagined it being salty, a waste of salt and, well, a bit of a gimmick really. 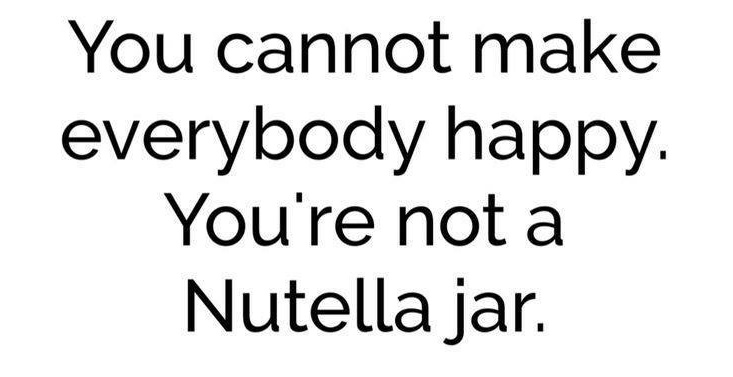 But then I saw James Martin cook it on his Christmas Feasts show. He talked about how the fish steams in its salt crust and raved about the taste. He caught my interest. Then I found a recipe for cooking fish this way in ‘The River Cottage Fish Book’, and when I watched Hugh Fearnley-Whittingstall demonstrating it on YouTube my mind was made up. I had to try it. James Martin’s Recipe uses lemon zest, thyme and rosemary in with the salt and I love that idea, but this first time I was keen to taste the fish itself and didn’t want to complicate it with too much else, so I kept the flavourings to a minimum, using just lemon zest mixed with the salt and a few bay leaves in the cavity of the fish. Hugh suggests mixing water with the salt to dampen it thus making it easier to pack around the fish. 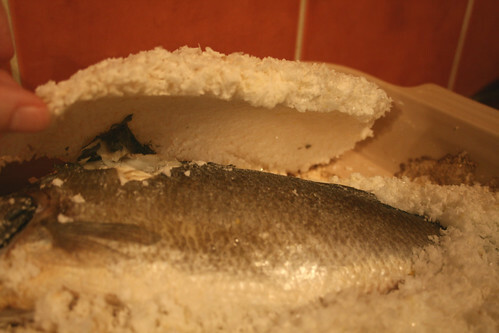 You need to place a thick layer of the salt onto a baking tray and then place the fish on top of it. 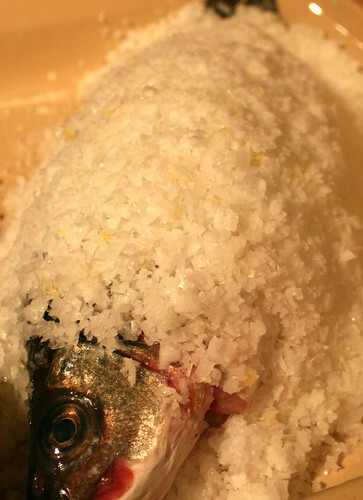 Next make sure the cavity is closed as much as possible – to avoid salt going inside – and cover the fish (except for the head and tail) with the salt and pat all around it to ensure it’s fully covered. 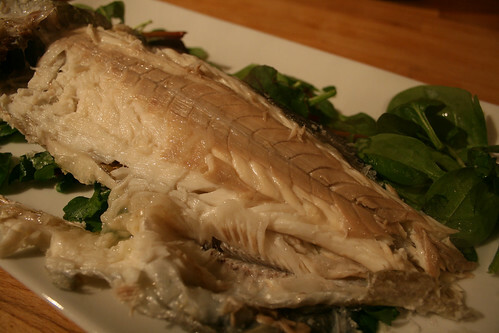 With the sea bass tucked up in its blanket of salt it was ready to go into the oven – I cooked it at 200c for 45 minutes. As the bass cooks the salt hardens, forming a crust, which you need to break off once the fish is cooked through – you’ll probably need a knife for this. And finally the moment of truth. The first thing I noticed when I carefully pulled back the skin was how tender and succulent the flesh was. This method of cooking really does keep all those juices inside the fish, instead of running out as they usually do. And this is the key to the success of this dish. 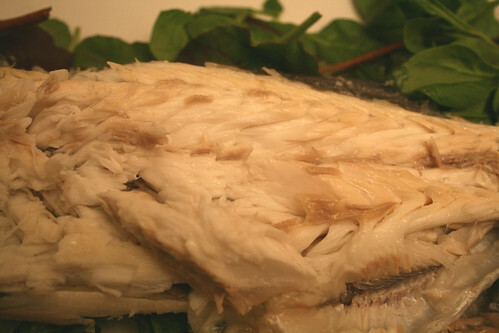 It was really noticable in the all important taste test – all those beautiful juices were full of the beautiful flavour of the sea bass; and the fish tasted absolutely wonderful. It didn’t taste salty at all; I just tasted a little salt around the edges of the cavity. I couldn’t really taste the lemon except for maybe a hint of it – and I do love lemon with fish so next time I’d like to try putting slices of lemon inside, as James Martin does. But really, with fish tasting this good, you could get away with using no flavouring at all. I adore the wonderful flavour of sea bass, and this way of cooking concentrates and enhances it in a way I didn’t think possible. I have to say it’s the best sea bass dish I’ve ever tasted. It would make a stunning dinner party dish and would certainly be a talking point. Expensive in salt, yes, but it really is spectacular – both visually and in taste – so for a special occasion when you want to impress I really don’t think you can beat this way of serving this glorious fish.